Weeds can give any homeowner or gardener a headache. They can be invasive and will affect the overall appearance of the garden and the health of the other plants. For this reason, it is important to execute an effective weed control strategy. Among others, one of the best things to do is to use a weed eater. Also known as a string trimmer, it is a handy gardening tool with a plastic cord or nylon string that can clear weed. It is a huge time-saver and requires minimal effort to use. With the plethora of the brands available, which one is the best? Read on and learn from some of our recommendations. Our team spent hours of research to provide a list of some of the best brands available on the market, as well as the specific models that will be worth your attention. This is an American company that has made a name for itself for its power tools and home improvement products, including gardening equipment. 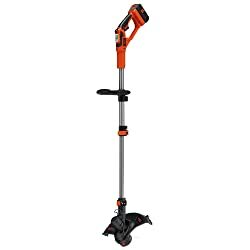 They have corded and cordless string trimmers, either with straight or curved shafts. Among others, one of its best features is the PowerDrive Transmission, which allows it to deliver superior cutting power, providing an assurance that you will be done in no time. The versatility of this model is also worth noting. It can be easily converted from an edger to a trimmer. Plus, it has a head that can rotate at an angle of up to 180 degrees. There is also POWERCOMMAND Variable speed setting to choose the right speed for a task. Like the weed eater that has been mentioned above, the power of this model is also derived from its 40V Max lithium-ion battery that provides an extended runtime. Your comfort is not a thing to be worried about. It weighs only 4.7 pounds, making it easy to move around. It also comes with an ergonomic handle to minimize fatigue. Lastly, it also comes with the innovative automatic feed spool that will allow you to work continuously in the absence of bumping. Value for money – this is the reason why this is another product that should be on your list. Aside from the string trimmer and edger, it also comes with an innovative sweeper. When using this trimmer, you can expect that it will be lightweight and comfortable. Best of all, despite the powerful trimming performance, it does not produce a loud noise. It will never be annoying to use it in the garden. If you are looking for power tools for your home and garden, this is one brand that you will surely encounter. The company has established its reputation in the market for providing tools that are good for the environment. The performance of this product will be hard to match, which can be partly attributed to its 10-amp motor. Plus, it has a trimming path of 18-inches, allowing you to do more within a short span of time. For the comfort of the user, it is impressive that it comes with a cushion and over-mold grip, which makes it possible to absorb vibration. There is also an auxiliary handle so that you will have a higher degree of control when it is used. One of its main differences from the product mentioned above is that this model is cordless. This is perfect for larger yards, which means that you can move around with ease. With the push-button start, this is sure to be user-friendly. No more need to pull a cord to get the unit started! The 4-position pivoting head is one more thing that makes this an impressive option for the best string trimmer. This means that you will be able to trim and edge in multiple angles, making it a versatile gardening companion. When you purchase this string trimmer, the battery is not yet included. However, with the 2.0AH battery, which is recommended by the manufacturer, it can run continuously for up to 45 minutes. The unit is powered by the DigiPro brushless motor. This provides power and reliability, which is similar to what you can expect from a 32cc gas engine. Meanwhile, the unit comes with the revolutionary split boom design, which will allow it to accept a variety of gas attachments, making it excellent when it comes to versatility. When it comes to outdoor power equipment, including weed eaters, Dewalt is another brand that should be mentioned. They are known for their high-end models packed with the most innovative features, making the price justifiable. 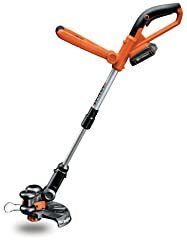 If you are looking for a compact and lightweight string trimmer that does not compromise power, this is one model that should be on your radar. Equipped with a brushless motor, 20-volt lithium-ion battery, and patented gear-drive design, you can be confident that the performance will be hard to match. After all, it is made by Dewalt! Many of its users have also expressed words of praises for its variable trigger, making it easy to choose the speed that is suitable for a specific task. The power, price, and design are three of the best assets of the weed eaters from Worx. They are more focused on manufacturing electric string trimmers, including those that are battery-powered. One of the many reasons to love this model is the fact that it comes with a multifunctional design. Aside from being a string trimmer, you can also use it as an edger, and even as a mini mower. The tilting head of this model is also a plus. You can have it positioned at a specific angle to handle different tasks. Another unique feature that you will find in this product is the flower space guard. The latter does not only work as an edger guide, but it also provides protection to the vegetation. This shares many of the features that you can find in the product that has been mentioned above. 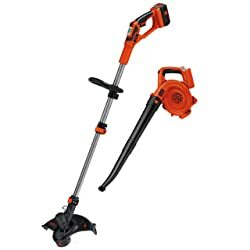 The best thing about this product is the tool-less conversion, making it effortless to have it transformed from a string trimmer to an edger. The 20-volt lithium-ion battery is also great. Nonetheless, it is not at par to those models that are equipped with a 40-volt battery. Despite this, the performance can prove to be impressive. This is a brand that is sure to be recognized by the handymen out there. Their weed eaters, meanwhile, are more focused on the gas-powered models, which have gained reputation for being hard to rival in terms of their trimming and cutting performance. This model features the X-Torq Engine, which has been exclusively developed by the manufacturer to cut harmful emissions by 60% while being able to increase the fuel efficiency by as much as 20%. Lastly, it has Smart Start. Despite being gas-powered, the unit can start in a manner that is almost effortless on your end. This is a premium brand known for their innovative products that are used even by professional landscapers. While most of their products are commercial-grade, you can be confident that they have user-friendly features. If you are a professional gardener looking for a weed eater that is capable of handling almost any task, this is the perfect choice for you. Despite the powerful performance, however, it is housed in a sleek and lightweight body that makes it easy to use. In terms of its construction, you will love the aluminum clutch housing. This is the one that prevents it from overheating. Meanwhile, with the lined solid steel shaft, it can effectively minimize vibration, which will be critical for your comfort. This might be not as popular as the other brands that have been mentioned above, but you can be confident that it has superior quality. They are not as powerful as the higher-end models, but their trimmers are known for being user-friendly. It is a perfect choice for small lawns. With a cutting path of 14 inches, this electric weed eater comes with a 5-amp motor, which is rated only for small tasks. It comes with an extra-wide head to make sure that the job will be done quicker. The telescoping shaft is also a plus, especially when it comes to versatility. This will allow you to customize its length depending on what you are most comfortable with. Lastly, for your peace of mind, the manufacturer of this model is offering a two-year warranty. Gardening does not need to be a complicated task. To make it easier to accomplish and to avoid being intentionally lazy, the best thing to do is to choose the right equipment. While there are many gardening tools that can prove to be handy, the weed eaters mentioned above are some of the best. They are packed with exceptional features that give them an edge over their competitors.